Space Shuttle Orbiter Discovery’s almost 30 years of processing at Kennedy Space Center’s (KSC) Orbiter Processing Facility (OPF) came to an end on Friday with the retired spaceship’s transfer out of OPF Bay 1. The orbiter traded places with sistership Atlantis, which returned to the OPF from High Bay 4 of the Vehicle Assembly Building (VAB). Discovery’s move marked the conclusion of Transition and Retirement (T&R) work on the one-year anniversary of landing at the conclusion of her final flight, STS-133. 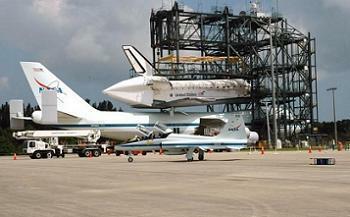 Discovery was backed out of OPF-1 and pushed back on the tow-way between OPF-1 and OPF-2. Meanwhile, workers backed Atlantis out of her temporary parking place, swung her around, and towed her in front of OPF-1 where she was parked temporarily. Then, as a small crowd of Shuttle team members gathered with media for the photo opportunity, Discovery was towed by Atlantis, before taking the spot Atlantis left warm in the VAB. 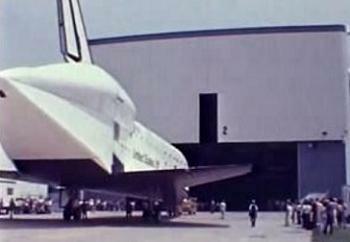 After Discovery was spotted in the VAB, workers returned to finish moving Atlantis into OPF-1. Discovery’s move out of the OPF and into VAB High Bay 4 comes a little more than a month before the planned mid-April ferry flight to her Washington, D.C. area retirement home. Sporting the shells of her decommissioned Reaction Control System (RCS) hardware and one of the aerodynamic ferry tailcones covering the back of her boattail, Discovery looked to most outward appearances like she just got back to Florida from a landing out at Edwards Air Force Base in Calfornia. Her ready-to-fly outside appearance somewhat belies the nearly year’s worth of decommissioning to make the spaceship safe for the public to view up-close at the National Air and Space Museum’s Udvar-Hazy Center. “The main thing is getting the vehicle safed, so that it can be in a public environment,” Stephanie Stilson, NASA Flow Director for Orbiter Transition and Retirement, said during a question and answer session with assembled media. “Right now, we keep them in these Orbiter Processing Facilities, where you have to be badged and trained to even go near a vehicle. 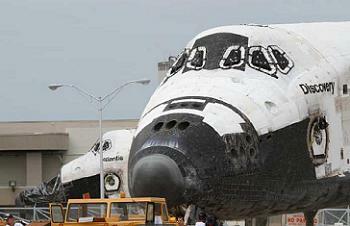 Atlantis moves back into the OPF after more than a month in the VAB. She was moved out of OPF Bay 2 on January 20th into the VAB Transfer Aisle and then rolled around to High Bay 4 on February 2nd. While in VAB High Bay 4, Atlantis was leveled on jacks to begin work to remove aft compartment components of her Main Propulsion System (MPS), which are being donated to the Space Launch System (SLS) development program. Meanwhile, work to finish decommissioning of orbiter RCS hardware continues. Atlantis’s set of RCS modules, consisting of a Forward Reaction Control System (FRCS) module and two Orbital Maneuvering System (OMS) pods, was shipped out of KSC at the beginning of the month to a facility in White Sands, New Mexico, for decommissioning. While all of the flight orbiters flew with the FRCS module they were manufactured and assembled with, the OMS pods were more or less interchangeable. As a result, Atlantis finished her flight service with her own FRC4 module and with the LP04 and RP01 OMS pods. FRC4, LP04, and RP01 are expected back at Kennedy at the end of May. The “ship-set” that Endeavour flew STS-134 with, FRC5, LP03 and RP04, is back at KSC after decommissioning, arriving back from New Mexico on February 6th according to NASA. FRC5 was reattached to Endeavour on February 8, and LP03 and RP04 are scheduled to be reattached this month. 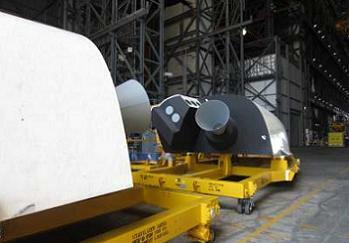 Discovery is standing in the VAB with her FRC3 module and the LP01 and RP03 pods that she finished STS-133 with. 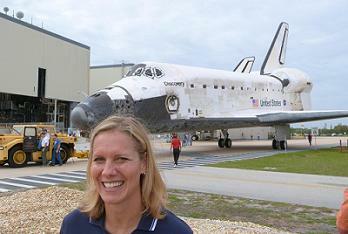 Also known as Orbiter Vehicle-103 (OV-103), Discovery was first towed to OPF Bay 2 at the time of her first arrival to the Space Coast, in early November, 1983. Thirty-nine missions and not quite twenty-nine years later, the flagship of the Shuttle fleet will spend the next month or so in the VAB before KSC workers repeat the steps of her first arrival in reverse. She will be towed from the VAB out to the Shuttle Landing Facility on her landing gear, aerodynamic tailcone still attached, in mid-April. There she will be secured in KSC’s Mate Demate Device and raised off her landing gear. The gear will then be retracted and the landing gear doors closed. She will then be lifted on top of the NASA-905 Shuttle Carrier Aircraft for a ferry flight up to Dulles International Airport. The flight still remains planned for April 17th. Discovery’s arrival at Udvar-Hazy, which is adjacent to Dulles, will start a four-day festival of events and activities to welcome the vehicle to the museum and the public. After she is demated from the SCA, Discovery will be towed just outside of her new home, the James S. McDonnell Space Hangar, for her welcome ceremony on April 19. Discovery will be positioned next to Orbiter Enterprise for the ceremony.